Providing cash flow solutions to businesses throughout: Houston and New Orleans. Riviera Finance is an invoice factoring company providing the following services for companies in Houston and New Orleans and all cities throughout Texas. A local delivery service, had reached their credit limit with their bank. 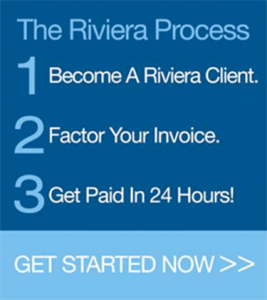 The bank refused to raise the limit so that the company could grow so they turned to Riviera. We worked with the bank to come up with a plan for Riviera to provide the company with the needed credit for future growth. Now, the company is able to expand and prosper without worrying about credit limit restraints. In addition, Riviera’s Online Account Management (ROAM) service has helped the company to keep a firm handle on their customers down to each invoice. This company was established because of the increased demand for welding and fabrication to service the oil & gas industry. They had been self-funding and operating successfully for two years. As they continued to take on new customers, they found that waiting 30 to 60 days for payment was no longer a viable option for their business. After setting up a factoring facility with Riviera, they are now able to take on new business with confidence that money won’t be a problem.